When doing any type of construction work around existing trees, it is important to protect tree roots from harm. Did you know that a trees roots extend out 2-3 times as tall as the tree? Trees need roots in order to stay alive, remain upright, grow larger, reproduce and defend themselves from pests, pathogens and decay. Roots do this by providing trees with stability, access to water, access to nutrients, and cultivating symbiotic relationships with beneficial soil biota. 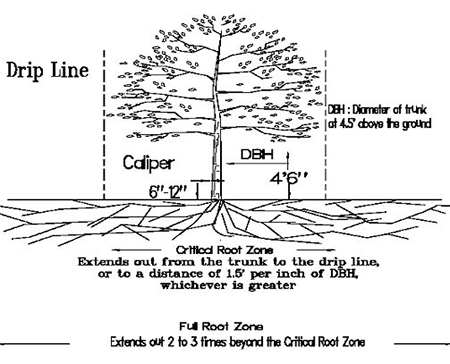 The minimum amount of roots trees need for survival are called the “critical roots.” These critical roots exist in the soil surrounding the tree, called the “Critical Root Zone,” or CRZ. A legal CRZ area is determined by using a formula based on a tree’s trunk diameter, as defined in municipal codes. Most municipalities define a legal CRZ as a circle with a 1, 1.25- or 1.5-foot radius for each inch diameter of the trunk. To find the size of the CRZ circle when the ratio is 1:1.5, measure the trunk 4.5 feet above the ground, called diameter at breast height (DBH). Then measure outwards from the trunk 1.5 feet for every inch DBH. This will give you the legal CRZ. 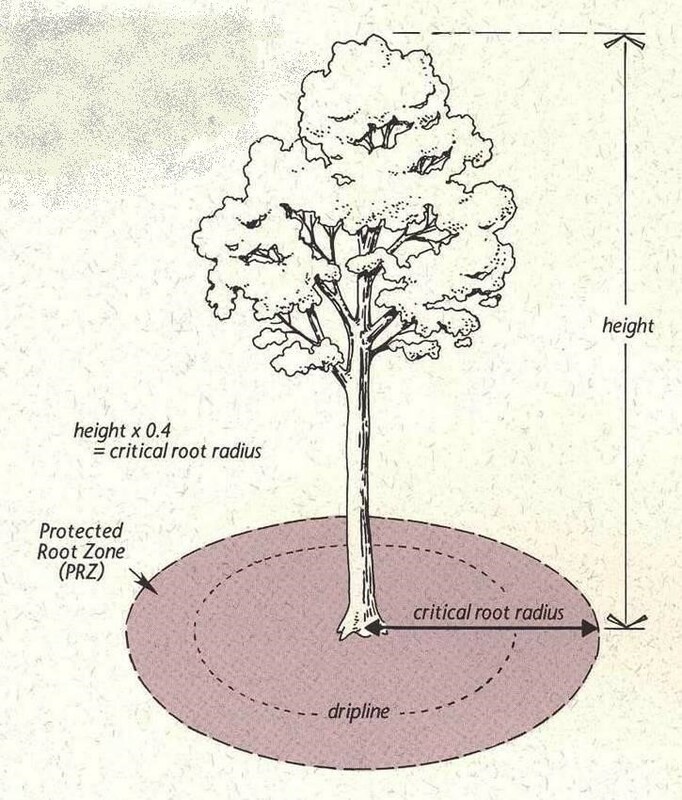 For example, if the legal CRZ is 1.5 foot for every 1inch DBH, a 20-inch diameter tree would require a 30-foot radius circle of protection around the tree to meet the legal CRZ standard. Generally, municipalities require that the legal CRZ have a minimum of a 6-foot radius regardless of tree diameter, although this varies from place to place. 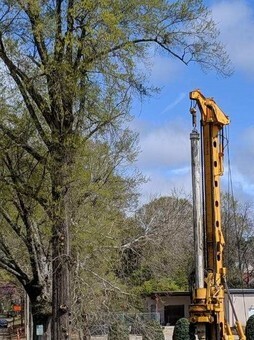 A biological CRZ area is determined by an arborist through analyzing tree characteristics, site factors, and anticipated construction impacts. In other words, the biological CRZ is defined as the area needed to preserve the roots necessary for the tree to survive construction. For most trees growing in an open setting, the biological CRZ spans from the trunk to the edge of the canopy, or the “dripline.” For older trees, sensitive species, or trees growing in poor sites, the biological CRZ many actually be much larger than the dripline. Conversely, younger trees, resilient species or trees on good sites may have a biological CRZ smaller than their driplines. For trees growing in a forest setting or with small crown sizes relative to their trunk size, the dripline may not capture all the roots needed for survival. In this case, the size of the biological CRZ may be found by using a DBH ratio calculation similar to what is done for the legal CRZ. An arborist can help determine what the ratio should be by evaluating tree factors (such as size, age, condition, and species sensitivity) and site characteristics (such as soil quality, water availability, and exposure). For young, healthy trees growing in good sites, the ratio could be as small as 1:2. So a 10-inch DBH sweetgum would need a circle with a 20-foot radius. For older, sensitive trees growing on poor sites, the ratio could be 1:4 or more. 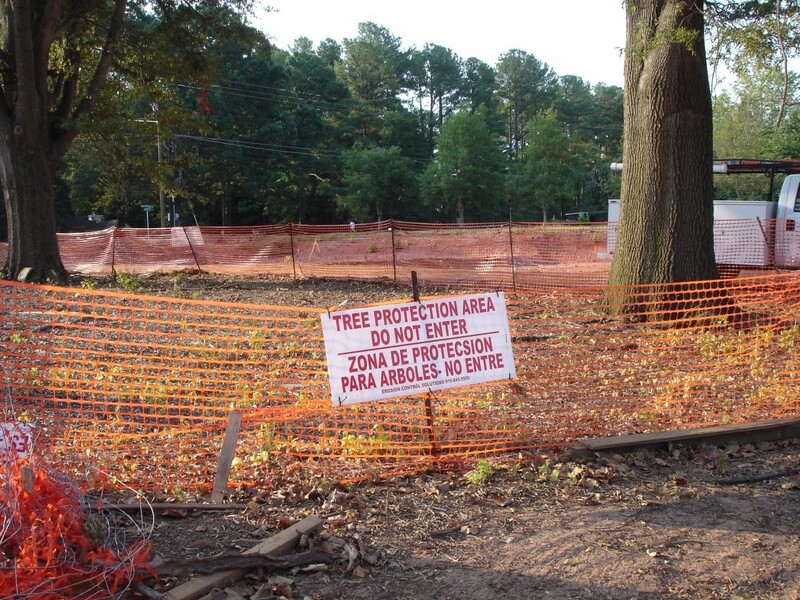 At a 1:4 ratio, a 24-inch DBH white oak would need a 96-foot radius circle of protection. While both the legal and biological CRZ varies from place to place and tree to tree, it is essential that we make the effort to preserve as many roots as possible. Trees provide many services to your site, and smart investment in protection pays dividends in results. We recommend creating a tree protection plan prior to any construction project, which identifies protection areas for trees remaining on site.